Vanessa Cramond is a nurse from Auckland, New Zealand, who recently spent two months as Emergency Medical Coordinator for Médecins Sans Frontières in Uganda, which is facing an unparalleled influx of refugees from South Sudan. “I’ve worked in population displacement responses for over a decade, and I’ve never seen the sheer size and magnitude of what I witnessed in Uganda. Over 230,000 South Sudanese people arrived in Uganda since January 2017, fleeing escalating violence by various armed groups in the Equatorial region, and all in need of immediate humanitarian assistance. Uganda is hosting around 900,000 refugees, making it the largest refugee hosting nation in Africa and one of the biggest in the world. "It is distressing to meet people who have experienced multiple displacements"
Uganda has a long history hosting refugees from surrounding nations, and because of that the government does not encourage ‘’refugee camps’’ as we might see and work on in other countries. Rather refugees are given a plot of land and some basic items and food and encouraged to resume a more ‘’normal‘’- looking life. People can move more freely, which is fantastic, but that can also make it really challenging to get to know the population and, from my perspective, to determine their health needs and deliver meaningful services. The sheer geography of the refugee settlements is also massive – you can leave in the morning and drive all day and you wouldn’t visit it all. One of the biggest problems the refugees and humanitarian actors face is access to sufficient ground water. I’ve never seen such long queues of people waiting to receive water at the tap-stands. When I arrived people were waiting days for water, with a huge line of jerry cans snaking through the settlement. 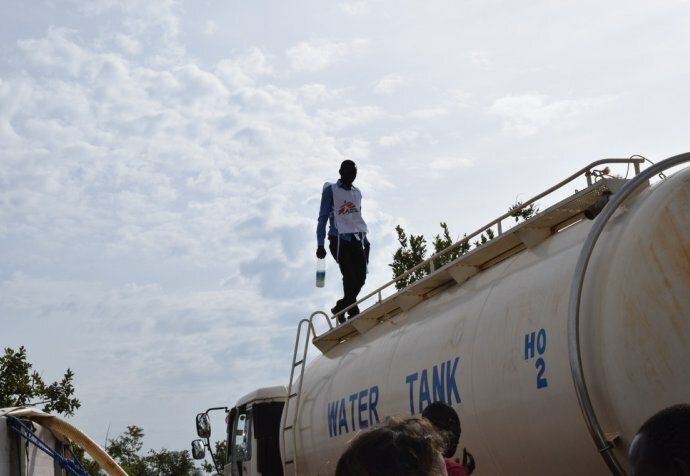 Our initial emergency response in Palorinya, one of the new refugee settlements, has involved pumping water direct from the river Nile and treating it. The establishment of this surface water treatment plant enabled Médecins Sans Frontières to provide up to 2.7 million litres of safe water every day. It was fantastic to see the progress in the two months I was there. By the time I left, people were noticeably cleaner, and the huge queue of jerry cans had all but disappeared. Instead of days, people were only waiting hours for water. Another important part of what we’re doing is community outreach and surveillance to try and improve our understanding of the population’s health. We don't just look at who comes through our clinic doors, we must also look at who doesn’t. Our teams go from house to house asking about recent births and deaths to project key information such as the under-five mortality rate and the crude mortality rate (CMR). We are beginning to understand the malnutrition situation, and although the rates of severe and acute malnutrition are okay for now, we’re expecting them to worsen as the rainy season comes and infections including malaria and diarrhoea increase, making children more susceptible to malnutrition.